This entry was posted on 6 July, 2012 at 1:23 pm	and is filed under Leicester Research Archive, Open Access, Research Support. Tagged: academic, bing, comparison, google, google scholar, indexing, publications, scholarly, scirus, search engines, statistics. You can follow any responses to this entry through the RSS 2.0 feed. You can skip to the end and leave a response. Pinging is currently not allowed. 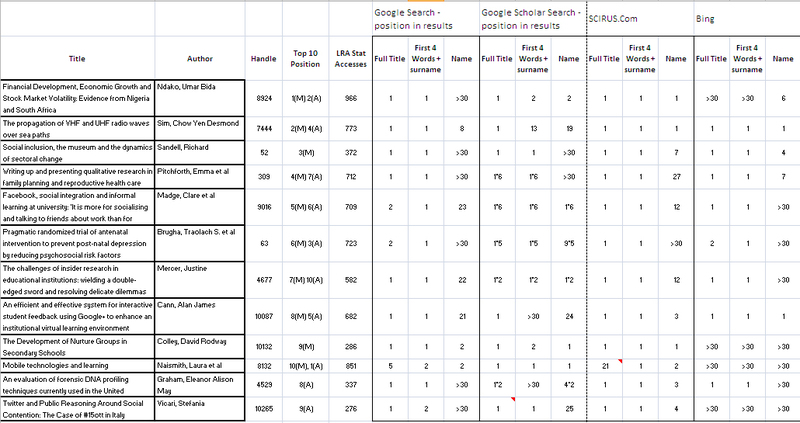 I normally go for Google Scholar first as it returns PDFs if available, making the access situation much clearer.